Alright, if you haven’t checked out part one of this review, read it here. And please take a second to check out our Headhunters Drumsticks review as well. These sticks are so interesting, I felt that I had to split them into their own review. They shouldn’t be buried at the end of an already SUPER long write-up. So, now we’re here. Headhunters’ Crossover concept appears to be, as far as I can tell (and as far as the U.S. Patent Office can tell), a wholly unique design. And it rules. All of the Crossover models feature drumstick bodies with wrapped handles (for grip – see our original Headhunters review) and a heavily tapered shank leading up to a grip-wrapped bulb. The bulb is a little wider than the handle at its widest point, and is wholly solid. To top the whole thing off, the bulb receives a short bundle of dowels made from either wood or a synthetic poly. Basically, they play like sticks but sound like a bundles with the added benefit of a knocking element in the bulb. The Crossovers are extremely versatile little units. The original Crossovers have 15 semi-circular bamboo dowels inserted into the bulb and a maple stick body. From what I understand, they fit into a drilled hole in the bulb for an extra secure hold. Throughout the testing period with all of the crossovers, I did not experience any issues with dowels breaking or falling out. As for Headhunters’ assertion that the Crossovers feel like drumsticks – they’re absolutely correct. Obviously, they flex a little bit in the dowel section, but otherwise, the balance, throw, and feel are all very much like a light 5A stick. Tones are light, but focused as a result of the dowels. They rebound exceptionally well, and feel excellent with double strokes or alternating rudiments. The bamboo dowels are light enough to handle articulate play on cymbals, but firm enough to pull big sounds from floor toms when needed. The bulb knocker elements were just awesome. I was anticipating a much softer sound as they are sheathed in grip sleeves, but they but they barely seemed muted at all. 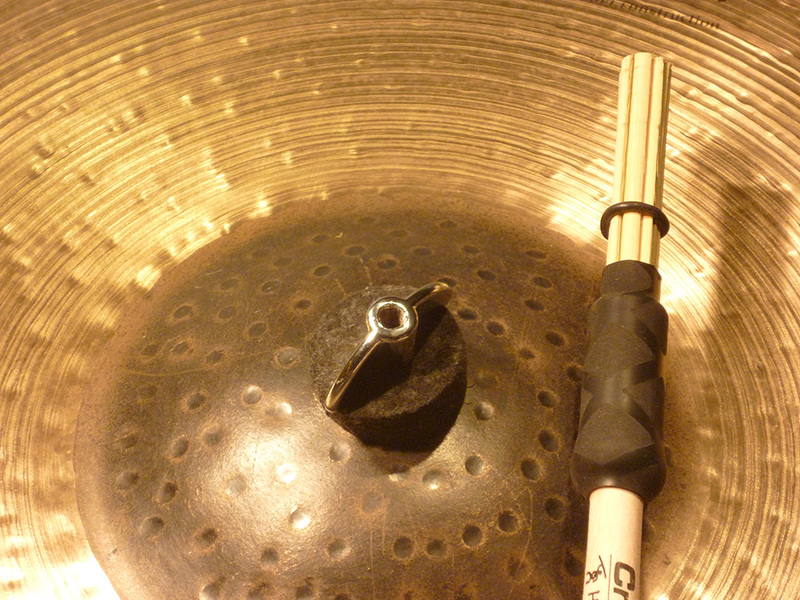 They were excellent for crashes and accent notes on ride cymbals or toms, and loved Latin-inspired bell patterns. They even offered a killer cross-stick sound. That was a huge surprise. The sound just a hair softer than what I get from most drumsticks, but still rich and cutting. The Crossovers II feature the same design, but with a slightly smaller diameter (HH’s site says it’s about that of a 5B, but I don’t think they feel as hefty as a 5B), and only ten bamboo dowels. The grip is still wide enough to feel very comfortable in hand, but the rest of the stick plays much lighter. The attack was surprisingly soft, but backed by lots of unexpected of lows. Again, great sound all around. The Bamboo Light version of the Crossovers II uses the same size stick body as the one found on the Crossovers II Bamboo, but replaced the 10 dowels with lots of much smaller bamboo dowels. The result is a much more airy sound with less meat in the note. Given the versatility added by the bulbs and their light weight, I think these would make perfect coffee house gig sticks. Even on snare drums with a medium tuning, it was difficult to create too much spectrum-eating sound. Alright, last but not least, the Crossovers II Poly utilize the same maple stick found on the previous two models, but replaces the bamboo bundle with 17 poly dowels in a similar semi-circular (or maybe tight oval) shape. These might be my favorite (non-brush – more on that later) instrument I received from Headhunters. They were crisp and mobile in hand, and pulled a remarkably full sound out of toms and snare drums. Cymbal strokes were clean but not overwhelming, and every note had just enough of that slapping click to keep them feeling like bundles. They produced dark, rich, and almost curiously fat tones. I absolutely loved these things. When it comes time to give all of these away, someone should definitely pick these. As is often the case when I review percussion instruments with which I don’t have a lot of experience, I learned a lot about (in this case) bundles and rods while working on this write-up. The tools Headhunters shipped over offered loads of range and possibility, and helped me uncover a world of new sounds. Couple that with the fact that they are also exceedingly well made, and I’d say I was thoroughly impressed with what I checked out. Whether or not you enjoy playing with bundles or rods, I think you could easily find something in this set for you.